Saeco Xelsis Titanium is like having a coffee bar in your kitchen. Making use of the latest technology, the Saeco Xelsis Titanium espresso machine is versatile and able to make a wide variety of coffee drinks. Espresso, cappuccino, latte and regular American coffee. Simply swipe the touchscreen to choose from 15 coffee drinks. Using the Saeco Xelsis Titanium espresso machine is like having a coffee-bar in your own home. 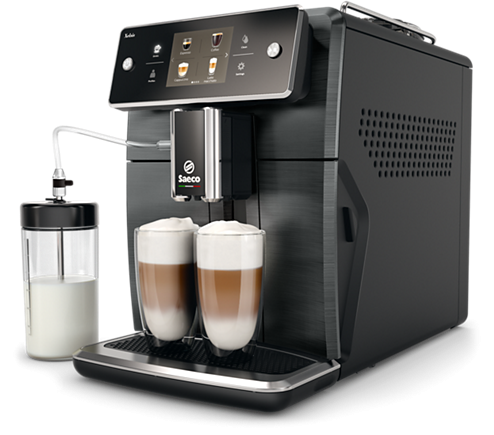 Making use of cutting-edge technology, the Xelsis is extremely versatile and able to offer multiple types of beverages, all of which can be completely personalized: from strong Italian espresso to a mild American-style coffee, cappuccino to latte, and even hot water for a cup of tea. It is possible to create up to 6 user profiles, of 6 drinks each, customizable for each family member. The Saeco Xelsis espresso machines’ 36 unique beverage settings are all activated with the simple touch of an icon. All beverages and functions are accessed through the wide, easy-to-read display screen located prominently on the front of the machine. 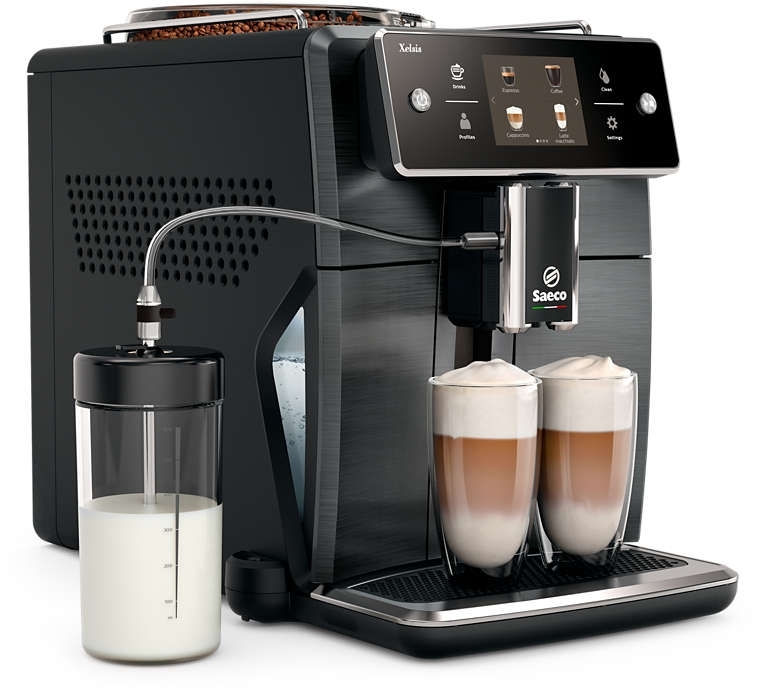 The Saeco Xelsis also provides an entirely integrated milk solution to automatic espresso machines, making it easier than ever to enjoy cappuccinos or lattes at home. 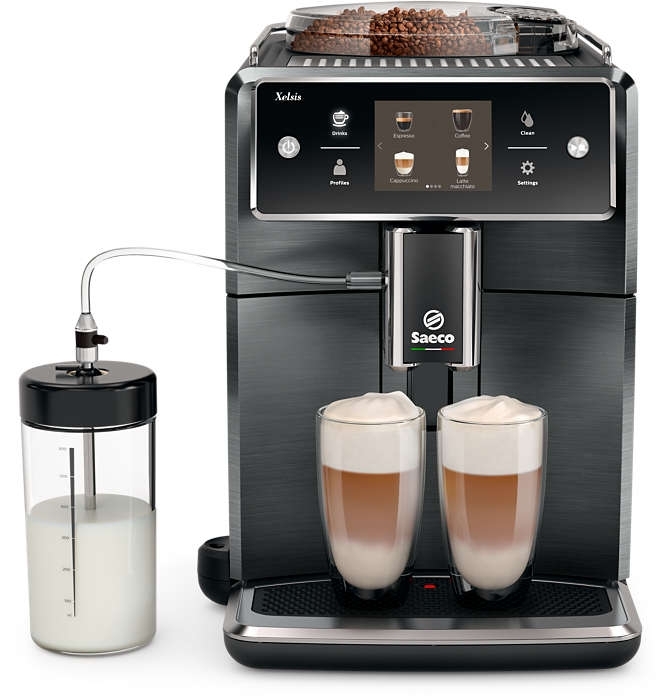 The large external milk carafe with a built-in cappuccinatore hooks directly to the front of the machine, automatically frothing milk directly into the cup. The milk circuit is completely separate from the rest of the machine so that no milk operations involve the internal machine circuits. This makes milk carafe cleaning fast and immediate, with no intervention required from the user. Utilizing the finest materials such as stainless steel and chrome to offer an elegant and noble touch to this new machine, the Saeco Xelsis espresso machine fits easily into any kitchen décor. The robust and sturdy construction will result in long-lasting performance. Individual Profiles: 6 users can customer program up to 6 drinks. Tri-Color touch screen interface - volume, temperature and strength are programmable. I own this machine currently. It is my fifth or sixth espresso machine and 3rd automatic. It's quiet and beautiful (if you don't mind wiping down the stainless) and very programmable. I also love that Saeco makes it easy to remove and clean all the internals - essential if you use oily beans. The automatic steamer for milk works great and it also has a steam wand if you want to do it yourself. Unfortunately, Saeco's only make one shot at a time... Sure, you can press the button twice so it will make two sequentially, but who wants to wait? Especially difficult when entertaining to make one shot at a time... At this price, a machine should make drinks faster. It also seems like you are always emptying the hopper or the tray or refilling the water tank. Please enter your email to receive a restocking update.